My name is Summer and I have been a Saintsations cheerleader for the New Orleans Saints for 3 wonderful years. I cannot even begin to describe how honored and excited I was to be a part of the ProTour Productions tour visiting our brave military in Camp Zama Japan! In the beginning, I had high expectations. My experiences I had while visiting, surpassed all of them. My tour group consisted of three NFL cheerleaders representing the St. Louis Rams, Indianapolis Colts, and the Tennessee Titans. Within a few minutes of meeting them, we instantly bonded and became really close friends. Not only were they beautiful on the outside, they were just as beautiful on the inside and that is what I believe true beauty represents. I also found this trait within my tour manager Vicki Grimes. Vicky as well as Randy Benton ( a Camp Zama club manager/superhero ), Robert Chance ( our professional bus driver), and Yuichi Poco Imada ( our photographer who is also a Japanese Champion cyclist) , went above and beyond their job duties leading, directing, and guiding us throughout our time spent at Camp Zama. I am so appreciative of the ProTour Productions company for opening doors that made my new friendships possible. It was such a blessing to have the chance to shake hands and personally thank our courageous military troops overseas and to do our best to bring a sense of home to them. Freedom is such a beautiful thing and it is all because of their sacrifice that we are able to do the things we do today and for that I am forever grateful. While on base, we also got to visit with many of the military families, lead and directed exercise and dance classes in their schools, and held a dance clinic with Jubilly Dance Crew, a local Japanese dance studio. Very few Jubilly students spoke English, but luckily we had great translators. I fell in love with the Japanese people and culture. Even though I did not speak the Japanese language the power of dance was our connection and universal language. Although, I have many amazing memories from my trip, one of my favorites happened on “Super Bowl Monday” ( since Japan is 15 hours ahead, our tour leader joked that we were going “into the future to see the past! 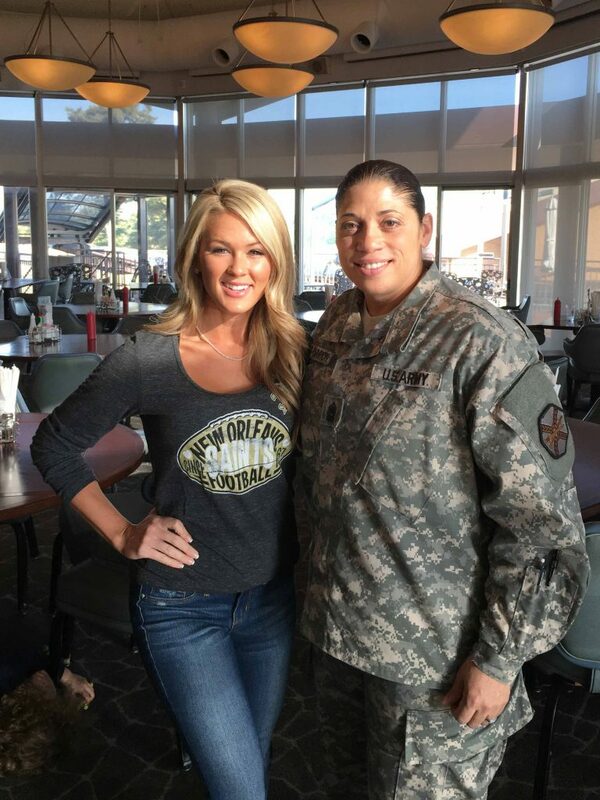 ” ) At the base, Camp Zama throws a big Super Bowl party for the troops. At the beginning of the big game ,following our performance, we stood tall with a giant room full of our military personnel as the National Anthem began to play. At that moment, I became very emotional standing with such a large group of selfless men and women. As tears streamed, I thought of how much they sacrifice for people like myself and for our country. It made me really consider how many things that I take for granted. Being a part of this experience, gave me a whole new outlook on life and for our military.I would like to give special thanks to our military and their sweet families, the New Orleans Saints Organization, Camp Zama and all of the staff that helped make our visit possible, Vicki Grimes, Randy Benton, Robert Chance, Yuichi Poco Imada, Tomako Kojima, Lesslee Fitzmorris, and a HUGE thank you to Sandy Charboneau the CEO of ProTour Productions. Without the ProTour Productions company, none of this would have been possible. Leaving was incredibly difficult to do. In all, my experience here was life changing. Camp Zama will forever be in my heart.